As with any major tournament, there are plenty of lessons to be learned. After such a grueling test, the latest in the Lessons From… series looks at what we can learn from the players who survived and thrived. Whether you are playing with a lead or in the midst of a low round, it is important to embrace the challenge in front of you. It is human nature to become tentative and cautious in these situations, so we need to make a goal of staying brave. Like Kaymer said, if you hit a bad shot, you hit a bad shot. Focus your attention on executing your routine free of fear and making committed, free swings. How easily we forget that golf is a game. At times we are faced with situations that put everything in its right perspective. Erik Compton, a man on his third heart, has faced situations like this his whole life. He was able to take on the U.S. Open, one of the biggest stages in sports, and keep the right perspective throughout. Thankfully, we don’t all have life-threatening health issues, but we all have things that can put the game in its right perspective. Don’t forget to step back and see the bigger picture when the game beats you up. Golf is a difficult game – no one denies that. 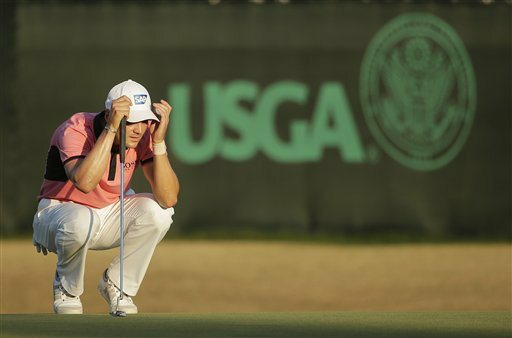 And it is at its most difficult during the U.S. Open. The great teacher Bob Toski said, “Golf is a non-violent game, played violently from within.” Pinehurst presented the players with conditions that tested every bit of their patience and composure. An often overlooked part of golf is how you view its difficulty and challenge. Do you love the unpredictability, the mystery, the challenge of the game? Your choice when faced with a difficult situation is to embrace it as an opportunity to test yourself, or focus your attention on how unfair it is, complaining and wasting precious energy. To help you take on the better mindset, try to take on the perspective of “Let’s see how my game holds up” or “I can’t wait to see how all my hard work pays off”. This is what I wrote about earlier – a Mastery mindset. Embrace the difficulty of the game rather than letting it wear you down.